Looks like I am on a little design jag here. Due to demand, I’ve been dreaming up more sweaters to be knit in the round. At the same time, cables are worming their way back into my brain as well, resulting in two cabled yoked sweaters in magazines this Fall. I’ve seen this magazine in larger bookstores like Borders, so it is available in the states. 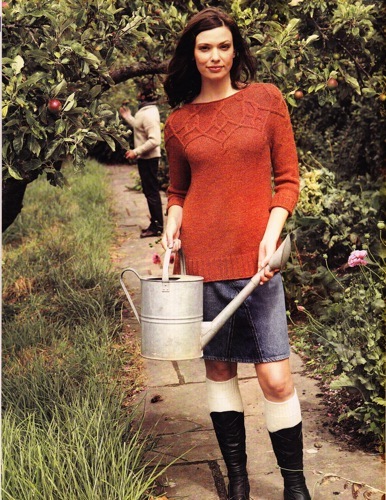 It’s Knitting Magazine #81, October 2010. The pullover is knit in Ultra Alpaca. I am such a firm believer in cable charts and both of these charts make easy work of cabling and decreasing at the same time. One small chart is repeated around each yoke. For me it’s a bit addictive, and I find myself going faster and faster as the number of stitches diminishes and sweater completion looms ever nearer. As I look at my most recent Ravelry design page, I wonder if I may be a bit addicted to orange these days too! I love a good cabled/textured yoke! I have to wipe the drool slobber off my keyboard. Those are yummy! I really love your designs and instantly knew that sweater in VK was one of yours. Just beautiful! I actually found the issue of Knitting mag at Joanne’s Fabrics and was able to use a coupon to get it half price! Now if I could just finish all the Christmas gifts I’m working on, I could make the burnt orange yoked sweater for moi! well done, this sweater is just fabulous! is there anywhere where I can purchase the pattern? thank you!! !